Paul Hindemith is not an obvious candidate for my recent thread on musicians as artists. But the sleeve above is from Hyperion's recording of Hindemith's Ludus Tonalis played by John McCabe and the illustration is adapted from a special edition of the work illustrated by the composer. Hindemith's twenty-five 'Studies in counterpoint, tonal organisation and piano playing' were composed in 1942 and their true importance is obscured by an unjustified reputation as dry academic studies. 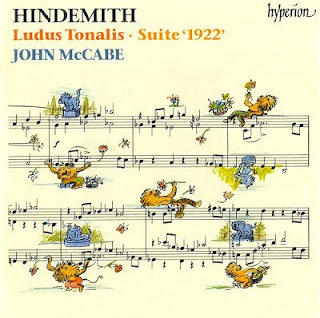 As amazon.com says; if you like The Art of Fugue, or Bach's 48 and Shostakovich's 24 Preludes and Fugues, or Kurtág's Játékok, you should try Hindemith's 'tone games' or Ludus Tonalis. Hindemith was, of course, no stranger to the world of artists. His 1934 Symphony Mathis der Maler was drawn from material from his banned opera of the same name. Mathis der Maler (Mathis the Painter) is based on the life and ideals of the early-sixteenth century artist Matthias Grunewald. 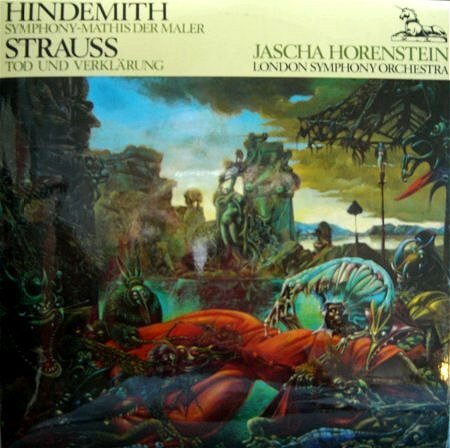 It was the 1973 Unicorn LP of the symphony shown in my lower photo that made me realise that record covers could be an art form; the painting is The Temptation of St Anthony by Max Ernst from 1945, which is also the title of the finale of Hindemith's Symphony. The Bob Auger engineered Unicorn LP plays as I write and still sounds magnificent. The sleeve notes remind me that the great conductor Jascha Horenstein also recorded Robert Simpson's Symphony No. 3 and a selection of Andrzej Panufnik's music for Unicorn. The pairing of Strauss and Hindemith on that LP allows me to retell two delicious stories from Geoffrey Skelton's excellent biography of Hindemith (Gollancz ISBN 0575019883 out of print). There was a healthy creative tension between Strauss, the traditionalist, and Hindemith the prolific progressive, and both were fixtures at the Donaueschingen modern music festival in the 1920s. After Hindemith's new string quartet was enthusiastically received at one festival Strauss asked the composer in his broad Bavarian dialect: "Why do you compose atonal music? You have plenty of talent." Hindemith replied in his equally broad Frankfurt dialect: "Herr Professor, you make your music, and I'll make mine." The return match took place at a later festival when Strauss attended one of Hindemith's concerts. Afterwards Strauss asked Hindemith how long he had taken to compose the work he had just performed. "Four days," Hindemith replied. Strauss drily remarked: "That's just what I thought." More adventurous music making from John McCabe here. "Hindemith was, of course, no stranger to the world of artists" - more prosaically Hindemith's father was a house painter. Afterwards Strauss asked Hindemith how long he had taken to compose the work he had just performed. "Four days," Hindemith replied. Strauss drily remarked: "That's just what I thought." Ouch! Strauss isn't quite in the same league as Sir Thomas Beecham when it comes to great one liners, but that's worthy of Sir Thomas. I haven't listened to the wonderful recording of Mathis der Maler with Fischer-Dieskau, King and Cochran; Kubelik, in quite a while, time to take it out for play. To my ear, the best recording of Ludus tonalis is by Boris Berezovsky, of the five or six I own. For those of us who still value complexity, intelligence, and discursiveness in music, the performance, and of course the piece, is a joy.